The original Sushi Go is a light family filler game that is a great basic introduction to card drafting. Originally released in 2013 (and reviewed by me in 2015), it has cute art, costs £10 and plays in about 30 minutes. It sits just outside the Top 50 family games on Board Game Geek and has won numerous awards. I’ve successfully used it as both as gateway and children’s game, with the 8+ age printed on the box being about right. 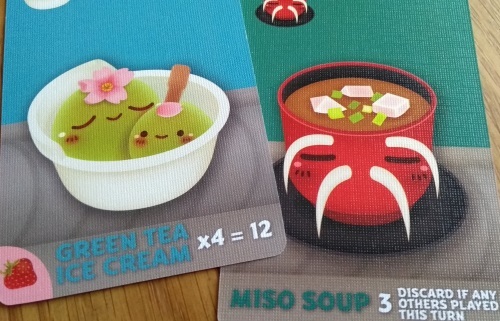 Sushi Go Party* isn’t an expansion, as such: it’s more of an expanded deluxe edition. You don’t need the original to play (this version includes all of the original cards) – I just didn’t see the worth in going through the basics again, as they’re mostly the same here (click the review above). It does take 2-8 players now though, where the original was only up to five. What does Sushi Go Party bring to the, erm, party? The only basic rule change is how puddings work: you put them to one side at the start of the game and introduce a few in each of the three rounds (presumably to decrease the chances of them bunching up). There are some minor tweaks to how many cards are dealt to each player, depending on how many people are playing (and extra pudding cards for 6-8 players). And you’ll also actually be playing with a tighter card deck each game (a 64 or 69 card deck depending on player number), so will see more of the cards in a round (bringing card counting more into the mix). As with the 2015 Gamewright edition, Sushi Go Party comes in a tin – but this one is about four times the size of the original. Inside you’ll find the original 108 cards have been expanded to 181, while there is also a scoreboard and player markers (you used a pan and paper in the original) as well as 22 menu tiles (more on those later). The tin feels oversized for what’s inside it, which isn’t helped by the plastic insert. This divider, in theory, allows you to separate the cards into types (more on why you need to do this below) and search them. Unfortunately it isn’t really fit for purpose as you can’t stand the dividers up (the menu cards) and get the scoreboard in the box to close it, so it’s hard to see what’s what. It also makes packing down laborious, as well as setup – not ideal for what is a relatively short game. It’s worth mentioning the rulebook, as there’s something it doesn’t bring to the party. The original game had a very serviceable two-player variant I always use that included a dummy player. For some reason this was not included in this expanded rulebook – a really strange oversight, as the game plays quite poorly with two without one. If you buy this and want to play two-player regularly, I’d suggest seeking out a good variant. 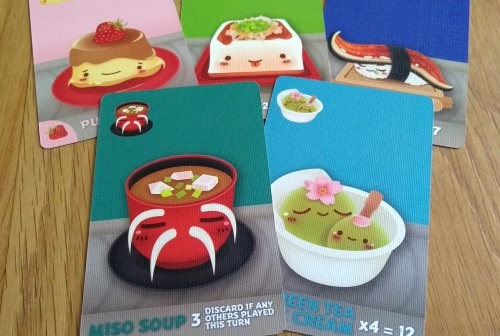 The new 73 cards add plenty of variety, as instead of just the original eight types of sushi card you now have 22. You always play with the standard 12 nigiri cards, but to make the game deck you now choose to add one of the three types of sushi roll; three of the eight appetisers; two of the eight specials; and one of the three desserts. The rulebook includes set menus such as the original set up, a basic version, a setup for more players (6-8) and a master menu for seasoned players – or you can of course make up your own selection by choice or randomly (as long as you stick to the right mix of card types). 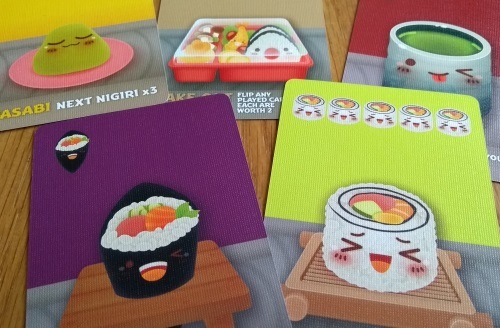 The cardboard menu tiles represent the different types of sushi and can be slotted into the scoreboard once you’ve chosen, presumably as a rules reference. You can make a simpler or slightly more thinky game from the new cards, as well as a high scoring or more interactive one – and doing a random setup can be interesting as you work out which cards may work differently. But it’s important to note that, whatever you change, the game very much keeps the essence of the original. For example, no one is going to change their mind thanks to this if they didn’t like the original. Is Sushi Go Party value for money? It’s hard to argue Sushi Go Party doesn’t offer reasonable value for money. You’re getting nice components and a solid game for less than £20. But it won’t be good value for everyone. While the scoreboard, menu cards and pawns look pretty they are completely superfluous to the experience – it wasn’t exactly hard to score three rounds on a bit of paper with the original. The pawns are actually quite poorly designed and don’t balance brilliantly; while all the cards include instructions and are well (even over) explained in the rulebook, so the menu boards you put in the scoreboard are also pretty much pointless. 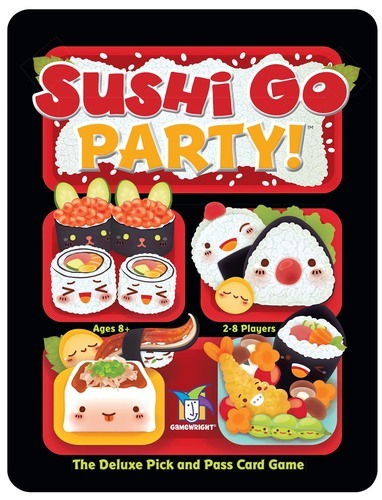 Is Sushi Go Party essential? This is going to very much depend on how, how often, and for how long you intend to play Sushi Go. If it is a family favourite that gets regular plays – and you often play it back-to-back once it is out of the box – then yes, upgrading to Party is probably a no-brainer. There is genuine variety and the extra plays you’ll get out of it will make up for the extra downtime you now have as you create the decks you want to play with each time. If you’re new to the game but are considering picking it up, and paying £20 rather than £10 doesn’t worry you, again it seems silly not to get this bigger version. If you don’t like the constant card swapping you can easily keep your favourite card combo together for simple regular plays. But the original still works really well for a cheap small box filler game (and there’s no reason you can’t play that version with eight players too). Personally, Sushi Go is a game I occasionally reach for on a very busy game shelf. It’s good for a quick filler play or with non-gamers, and for that I’m glad I kept it. But do I need a version taking up four times the space that is too big to transport for a holiday or game night for its relative worth – and that now takes a lot of setting up where it used to pop out of the box and play? Not really. I’m surprised they didn’t do a small box version too; an actual expansion that just including the new cards and rules: even at £10, making it the same price overall, I’d have preferred to be able to upgrade my original (saving £10) without the added bells and whistles. But for those who just wanted more sushi, you’ve got it in spades.